Fugly Horse of the Day: It's not a problem. Now lightning, there's a problem! It's not a problem. Now lightning, there's a problem! 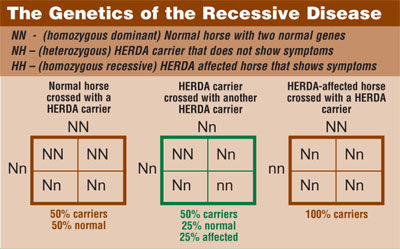 HERDA stands for hereditary equine regional dermal asthenia. 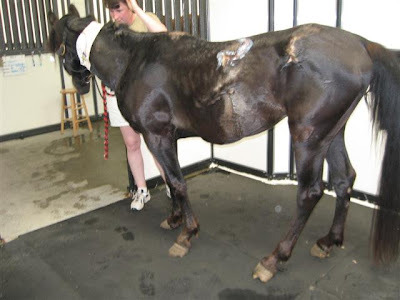 It is a horrifying disease where the horse's skin basically starts sloughing off its body. Here's a good description from the folks at Bringing Light to HYPP, who are also trying to address other genetic defects on their site. "When a horse has HC, there is a lack of adhesion within the dermis, the deep layer of skin, due to a collagen defect. Think of it like glue holding the skin layers together, only with HC, the glue is inferior. Because the layers are not held firmly together, they separate. When the horse is ridden under saddle or suffers trauma to the skin, the outer layer often splits or separates from the deeper layer, or it can tear off completely. It rarely heals without disfiguring scars. New damaged areas arise continuously, sometimes even without obvious trauma. It is, thankfully, more rare than HYPP, and it's harder to pass on. "The genes that cause HC are recessive, and it takes two to tango. This means that both sire and dam must possess the recessive gene in order for an offspring to possibly be afflicted with HC. " There are cases where horses with HC have lived to a fairly old age, says Rashmir, but they are treated as pets and great care must be taken to prevent trauma that can rip the skin. In dramatic cases, says Rashmir, the skin can split along the back and even roll down the sides, with the horse literally being skinned alive. Generally speaking, she says, the average lifespan for an HC horse is two to four years. " Like HYPP, this defect has been traced primarily (95% in one study) to the Poco Bueno line of Quarter Horses. Like Impressive, Poco Bueno is a line that has also been incorporated into breeds that allow QH blood, like Appaloosas, Paints and Quarabs, not to mention an untold number of grade horses. The horse at left was most likely a purebred AQHA stallion. 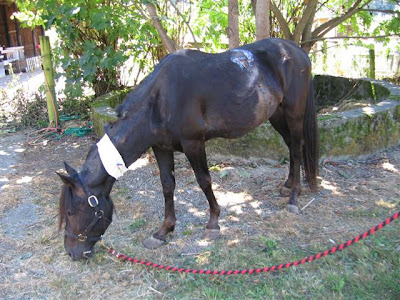 He was rescued, treated and mercifully euthanized by Save A Forgotten Equine. His previous owner dealt with his condition as many of these breeders do - he dumped him with a horse dealer to go on a double-decker bound for slaughter. "Ernie" was about 15 years old and appeared never to have had any hoof or dental care either. There is no telling how many carriers he sired, and I don't think any of us can even imagine the kind of pain he was in. Unfortunately, just like HYPP, many breeders do not want to accept that their horses may have this problem and take steps to ensure they do not pass it on. Many horse owners and breeders tell stories of colts born with what used to be called "Doc O'Lena disease" ditched at auctions and without papers, to go to the killers with no trail left to lead back to the big money cutting horse operations they came from. That is most likely what happened to Ernie. The NFQHA, which just loves to brag that they don't have HYPP because they don't register Impressive bred horses, does a quick 180 on the topic when you suggest that their beloved Poco Bueno was carrying something equally undesirable. They released a statement on HERDA in 2004 full of silly justifications like "It would be easier to produce a foal that will be killed by lightening than a HERDA foal." Well, guys, unless someone is breeding horses with metal ears, that's not really an issue now, is it? You're comparing apples to oranges. You can't control Mother Nature, but you can control what you choose to breed. Information about the genetic test for HERDA, which just became available in March of this year, at Cornell. I think it will be VERY interesting to see who tests and who doesn't. For those of you who breed cutters, reiners, etc. - remember to vote with your pocketbook and only breed to stallions who have been tested negative. Horse owners can also send pedigrees involving potential matings to Ann Rashmir, DVM, at Mississippi State University and she will analyze them and seek to determine the degree of probability of the offspring inheriting either the gene or the disease itself. A fee of $25, which goes directly into the HC Research Fund, is charged. The address is College of Veterinary Medicine, P.O. Box 6100, Mississippi State University, Mississippi State, MS 39762.